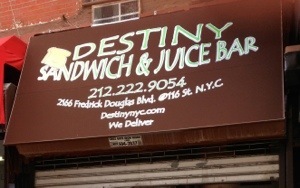 Destiny Sandwich & Juice Bar in Harlem opens with soft launch, stop by for a Harlem made smoothie | HarlemGal Inc. The owners of Destiny Sandwich & Juice Bar, located on Frederick Douglass Blvd. 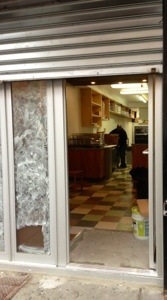 between 116th and 117th Street, tell HarlemGal Inc that they are open for business. We learned about this place back in April! 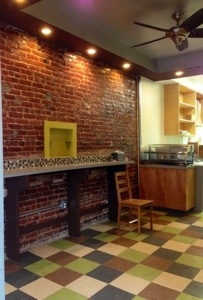 They started their soft opening over the weekend and will have limited hours for the coming week, 8 am to 8 pm. Limited items will only be available on the menu as well. Once they work out the kinks of being a new business in Harlem, their hours will be from 6 am to 10 pm Monday thru Friday. Then on Saturday and Sunday their hours will be 7 am to 10 pm. See menu here. Stop on by for a smoothie! See you there! This entry was posted in Harlem and tagged 2166 Frederick Douglas Blvd., Destiny Sandwich & Juice Bar, Food, Harlem, Harlem Blogs, harlem restaurant row, Harlem Restaurants, Harlem's Restaurant Row, juice bar, new restaurants in harlem, restaurants, smoothie, where to dine in Harlem, where to eat in Harlem. Bookmark the permalink.